As our conversation continues on way to eliminate the fat in our spending, Jordan and I took on our Fishtank. We have been maintaining a 90 gallon tank (pictured) for the last three or four years. Prior, both Jordan and I had smaller tanks growing up. I expressed to Jordan that I felt like the fish tank had become my hobby rather than our hobby. I knew he was on board when it came to buying plants and fish – and I’ve always known he’s wanted to move from freshwater to saltwater – but lately when it comes to the muck work (cleaning the tank) – it felt like a chore rather than a part of a hobby we enjoy together. Jordan expressed that he wasn’t enjoying it as much either – the placement in the house (our office) isn’t ideal and we don’t have the money to invest in making it amazing (the tank pictured is not what it currently looks like – it’s what it looked like a few years ago). So, we decided to decommission the tank. We sold some fish as part of our the project to fund the new couch, and donated the last few to a pet store in the city. On Monday night we drained all the water, cleaned the tank, and cleaned the filtration system. It’s a lot of work – but the hardest part will actually be moving the tank into the basement as an empty tank weighs about 160 lbs. Jordan and I have moved it by ourselves before but I’m just not as strong as I used to be – so hopefully we can get a friend or two to help out. We’re not going to sell the tank/stand because when we develop the basement in a few years, we’re going to set up a salt water environment instead. We will however for the time being save on electricity from the heat/light/filtration system as well as water (evaporation, regular cleaning-water changes). I’m not sure exactly how much – but it will be interesting to compare our bills from last year to this year. Yup, that's right. We are officially a one vehicle household again. You were with us when we bought the truck at the end of 2008 - lack of past credit history led to me co-signing a loan for Jordan for $4,500. It was scary then - we weren't married, just newly living together and everyone in the PF world say's 'never co-sign'...but I did and it worked out. We successfully paid off the truck in May, 2010 - way ahead of the 24 month amortization on the loan - through lump sum and increased bi-weekly payments. It was a lesson for Jordan and I - a big lesson on how to manage money as a couple and the power of duel income when paying down debt. We really became a partnership then when it come to managing money. The truck sold for $850 (high kms...over 400K) - $250 of which was the last chunk to pay off the line of credit for the new couch. Jordan and I carpool every day to work - so while there may be a couple times of year when it's a headache to have one vehicle - the longer term savings will be well worth it. We originally intended for the remaining $600 to go towards the house/back yard pool of money - however; Jordan would like to use some of it to buy some work clothes for me. I really do need another pair of pants and a blazer - so that might work out to split it up some. My mom, who comments here often, has always said to dress for the job you want - not for the job you have. So, in that case, I do need to step up my game a bit in the clothing department. The longer term implication of selling the truck however, is a reduction in our insurance premiums/registration fees. Jordan made those phone calls and found out that with two vehicles we were receiving a 15% multi-vehicle discount which, of course, we lost. In addition to that, now that we don't have second cheap vehicle, my name has to go on the Escape as on occasional driver and I have a crappy driving record. So. Our premium only went down by $9.38/month or $112.56/year. We also stopped in the Registry office. In the province of Alberta in Canada your insurance and your vehicle registration are separate. We had just recently renewed and so when we returned the licence plate, we were informed that we would be eligible for a refund. So, that said, in the next two to six weeks we'll receive a cheque for $64.50. Saving on annual registry fees and insurance means an approximate total annual savings of about $200. Not too mention that thing was a gas guzzler. Even though we didn't drive it often, it will be interesting to see if our 2013 gas expenditure trends down. Jordan and I secured our mortgage just prior to the Canadian Governments move last year to reduce the maximum mortgage amortization from 30 to 25 years. While right from the beginning, we knew we wanted to pay it off faster - the flexibility of a 30 year amortization meant we could adjust our payments to reflect our life circumstances higher or lower (within the confines of the mortgage agreement). Our total mortgage financed was $348,818.31 - monthly payments based on a 30 year structure, (5 year fixed) at 3.39% would have been $1,540.44 - our minimum. Most of you know, that we chose the accelerated weekly option - $385.11/week. Four months out of the year, there is a fifth week which reduced our amortization, and interest costs significantly. Our 2013 plan is to finish our back yard and our 2014 plan is to pay off our car - but with all my posts lately about saving money, I couldn't help but look into the future about the impact of adjusting our weekly mortgage payments. The calculator on my mortgage holder's website lets me review four different scenario's at one time. The first - just by increasing our weekly payments by $9.89/week - would shave another two years off of our amortization schedule. $10 = 2 Years! Going further you can see that by maximizing our pre-payment schedule, we could increase our payments by as much as $55.77/week to reduce our amortization to just under 17 years. Jordan and I would be 45 years old! Wowza! While I don't think we're ready to come up with the extra funds before the escape is paid off (it's at a higher interest rate anyways) - I know that within the next 3-5 years, we're going to be able to make some serious changes to our mortgage and be mortgage free before we're 50! Incredible! Jordan has been looking for a sectional ever since we moved into our new place a year ago. Among other furniture in our small living room, we currently have a regular couch (brown, microfiber, 3.5 years old, $500), and a recliner (brown, pleather, 1.5 yrs old, $200) - they are still perfectly functional - clean and all that - but they just don't fit. They are not only too big, but they are awkward for the shape of our space which makes it hard for more then two people to be comfortable. 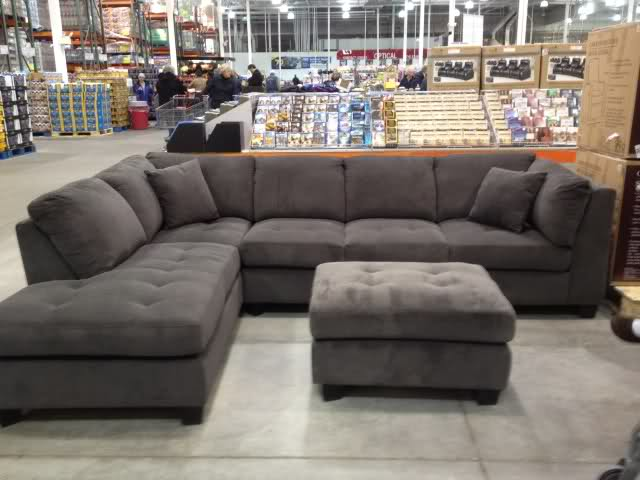 So, when Jordan was perusing Costco over Christmas he found the sectional pictured above (sans ottoman). Fell. in. love. When I finally got home, it was gone, sold out. He's been keeping tabs on the store ever since, and lo and behold just this past week they received a few more in stock. Jordan wanted it so much - and the risk of it being sold out again was high. At $899 (plus 5% tax) - it's unlikely we would find another model that was compatible in quality and price. Why unlikely, because it took a year to find this one. So, I made a deal. I told Jordan that he could buy the couch now (using our line of credit) and then come up with the money buy selling the furniture it would replace to pay ourselves back. The kicker being, that he can't open the boxes until the debt is paid. "I wanted the sectional because of overall seating, how it will open up the living room in terms of brightness, color matching theme, and because my wife said she wanted the living room to feel comfortable like the show homes. We need open and colorful living spaces to help uplift our moods, given the cold and dark winter months. I love selling items on kijiji, so the deal is easy :)"
So far - he's already sold the couch, ottoman, recliner, old kitchen table, 2 matching bed side tables, some fish and a queen bed frame - there's still a few items to go so we'll see how much $$ we end up with. The side benefit - we've started cleaning out our basement to get access to quite a few of these items - so all in all, it's been a pretty good deal for both of us. Have you ever contested it? For my NetWorth post a few days ago I went to my cities website and did a search for our tax assessment - pretty quick and easy! In looking at the details of the page, it indicates the square footage, if the basement is developed, if there is a fireplace and if their is a garage. All of our details were correct...except for the garage. It says we have one, we don't. I called in to let them know, and the person I spoke to was amazing. Very helpful! She made the change right away. Today, I got a letter in the mail that said my monthly tax payment has been reduced from $189.36 to $183.38 until Mail, 2012 - a savings of $29.90. Not too shabby for a 10 minute phone conversation. There have been times, where I have been frustrated with ING, but by and large, I have been very happy since we switched to Thrive back in January, 2011. These last two weeks have been no different. I was fortunate enough to be chosen to be part of the trial of their cheque in feature which allows me to deposit cheques by taking pictures with an iPhone app - a really cool feature! Over Christmas this was especially handy. Not only did we receive gifts to be deposited but we also were paid back for shopping for others using cheques - so in my very small town of 3,800 people - I could still get all the banking done that I needed. Once we got back from the holidays I realized that there was a bit of a snafu. Several of my cheques had been deposited twice...once when I submitted the photo, and then again once they received the original in the mail - whoops. One of them was even deposited three times! Well, ING got it sorted out and I can only imagine audited the rest of the beta users to make sure it hadn't happened with them too. That was all over the last few weeks - when I checked today I noticed I had a hold on $250 (the value of one of my deposits). I have good history with ING (no holds up to $5,000) - so called in. It had to do with the other snafu, but not only did the representative I spoke to get it corrected, he told me he would follow up with the Rep who put the hold so they could both learn from it. Wowza! Good customer service! Finally, when I was getting off the call, the Rep let me know about an RRSP promotion they have on right now. At every other financial institution I bank with, I always feel like they are trying to sell me something - but not in this case. 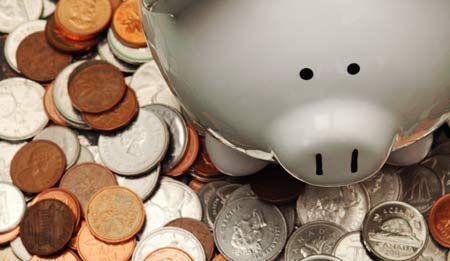 I was receiving 1.35% on my RRSP account - and now, for the next 90 days, will received 2.5%! It's not a lot, but it's a lot more than it was - and I didn't have to do any work to get it! As most of you know, Jordan and I contribute regularly to RRSPs rather then at the end of the year - so this is really the only thing we'll be doing this RRSP season. Inspired by a new year, and one of Gail Vaz-Oxlade's older posts about the life pie, I wanted to do some work to put together ours. According to Gail, the Life Pie "is very flexible and is only meant as a guide so that you have some sense of balance in your budget. If you’re way over in one place, you have to be way under in another. The bottom line is that you can’t spend more money than you make." You can see that because Jordan and I have 0% allocated to debt repayment, that leaves us a lot of wiggle room. We have decided to allocate this money towards life - we've got plans to finish the back yard this year (deck, fence ect) - so that money will come in handy. For anyone who doesn't recall the post, or didn't click on the link, here is the breakdown of Gail's recommendations vs the exact percentages of ours. Not only do we have 0% allocated to debt, we also spend less in housing then she suggests, and we contribute more to long term savings. For those who like the details, keep reading below. When filling this in, I started with what we spent last year and also had a look at what our budget for 2013 was - that helped guide this. Using our utilities tracking history and tracking our daily expenses (gas, vehicle maintenance etc.) also was a big help in being accurate. Jordan and I spent an approximate combined three hours on the phone this past Saturday morning with Shaw, Bell and Telus. We did a detailed review of our current services and then price matched with Bell and Telus followed by another call to Shaw (our current service provider) to see if we could push for any price changes on our bill. It's a game. a very competitive one at that - and these providers know it. They no longer are going to just drop the price, or give you a promo rate just because you ask for it - you have to know your stuff when you call in to force their hand. ....and, you have to be patient. A part of our conversation was also a review of the need for a home phone. Jordan and I each have a cell and we still have a home phone. Crazy...who needs three phones, plus we each have phones at our respective offices. I'm considering canceling my cell phone and keeping the house phone for more significant savings - really...I don't need to be checking my email when I'm grocery shopping or making a twitter update when I'm mowing the lawn. Jordan uses his phone for work - so we're a bit more limited with cancelling his. Overall, Telus offers the most competitive long term pricing. You can see from my notes that Shaw is offering a six month discount, and Bell a 12 month discount - but long term, Telus beats them both. Bell would come with a two year contract and Telus with three years - pretty significant commitments when Shaw offers no-contract service. They do try to sweeten the pot with the aforementioned temporary discounts and with Telus - a $300 pre-paid Visa. So here's where we need help. Jordan is sold on Telus - not only is it the best pricing, we would also be able to get fiber optic services - the latest and greatest - beyond standard cable and satellite...so they say. I am apprehensive about the contract. The wording in the cancellation clauses are pretty serious - basically they could bill you for any promo's you received in addition to discounts on rental receivers ect. (so that includes that $300 pre-paid visa). They also can bill you for downgrading services - so you have to be sure when you sign up that the services will meet your needs. So cancelling - would not be an option. The flexibility to cancel all services should our financial circumstances ever change is pretty important to me (say a maternity leave sometime in the future for example). However, I'm pretty sure that we would never cancel the internet...so I'm torn. The $300 pre-paid visa would go towards our back yard fund to help pay for that project. The 2013 savings of $742.20 would also go towards the back yard fund. So...what do you think? what would you do? As long as I've been tracking our daily spending, I've been tracking our expenditures on utilities longer. This late in the game, I wish I had a break down on gas, water, electricity, power, sewer, ect - but this includes it all. Having this much data gives me a huge advantage when setting up our annual budgets. I know, within a small margin, how much our bills will be each month. Given that the annual monthly average was $235 last year with the smallest bill being $149 and the largest $333 - it's very helpful to know how much to budget for. It's been quite a long time since I posted on our Networth - so I thought I would do a bit of an update. I don't think it's worth doing on a monthly or more frequent basis because quite frankly, our finances don't change that frequently - but I think ever six months could be a bit interesting. Yay! It's in the positive! Our credit card is 100% paid off!!! It was the first without my dad. It was also the first without my brother (he's moved to Winnipeg). It was Jordan's first without his mom and his brother (they were on a trip together). I tried to stay upbeat and positive, mostly I faked it until I could make it. I think for the most part people believed that I was in good spirits, and that put me in a better mood then I would have been otherwise. I had a lot of lists.. I always do, but this year it felt a bit more mechanical. That helped get through I think...task lists...accomplishing things. It’s hard to believe we’ve been tracking our spending for the last two and a half years…when I started that project, I really didn’t know how long it would go on for – turns out, it’s been an invaluable tool. Something key to note with both Annual Expenses and Emergencies – I am really bad at tracking those things. Typically what happens is the rest of spending (like eating out and gas w/ regards to emergencies and vehicle maintenance w/ regards to Annual) just goes up. Be that as it may, there’s still some interesting data here. A couple of downward spending trends that I’m happy about include gas, pets, and banking. Carpooling is working – and we stopped buying more toys then the dogs actually need. Our interest costs have gone down – but I am truly looking forward to seeing a much smaller number here next year. Like $0. Notable upward trends include groceries, entertainment, and home maintenance. My aunt suggested that perhaps we aren’t just eating more but it could be that the cost of groceries has just gone up over the last three years – something to think about. I don’t know if entertainment has actually gone up, or again, I’ve just gotten better at tracking that. This includes things like our Netflix subscription and any fights that Jordan has rented/watched with friends at the house. Home maintenance is a biggy – we moved last year, and bought a lot of ‘things’ for the house. What is not tracked well is the amount of $ gifts which helped us make some significant purchases this year. Does anyone have a tip on how to track spending that is unusual but was gifted? Some up/and/down trends include alcohol, and vehicle maintenance. We tend to buy a lot of booze. That’s true. We do a lot of socializing at the house and like to have a well-stocked bar. I also probably accidently included some Christmas gifts in the Alcohol spending. Vehicle Maintenance has changed as our vehicles have changed – I expect that this will continue to fluctuate. We’ve remained pretty consistent in our spending on medical, clothes/shoes/hair, and education. I actually think that we need to spend a bit more on clothes – I work in a professional environment and feel a bit raggedy-ann sometimes. We also need to make sure that Jordan always has proper footware for work too. There will probably be more, but that's what I have for now. Today, I hate the Bank of Montreal. All I wanted to do was change the payment frequency of my auto loan...shouldn't have been a big deal. They messed it up so bad the first time that my mortgage payment bounced. thanks. Then...then..after it was 'fixed', I found out that it actually wasn't. As it turns out the payments we had made weren't a change to the old frequency. They had just put the old payments on hold and created new principal payments. So when I called yesterday b/c Friday's payment hadn't gone through I was told that while I had made $200 in principal payments, my account was in arrears by nearly $400. So, I had to come up with a whopper of a payment that we weren't expecting or planning to avoid the account being sent to collections or some such thing. We didn't even get a phone call. And it was THEIR mistake.